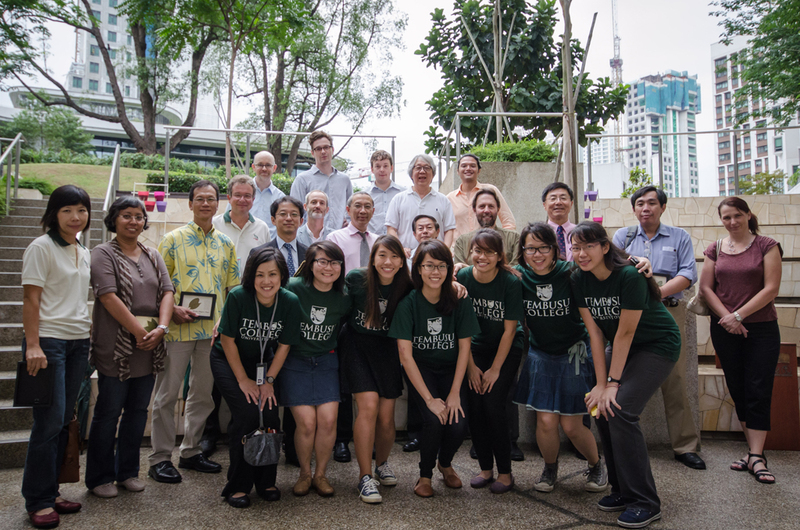 22 April was Earth Day and Tembusu College celebrated it with a tree-planting ceremony. About 50 Tembusians and guests were gathered to witness the planting of a camphor sapling that has been nurtured by a group of Tembusians for almost one and a half years. It now stands as a symbol of Tembusu College’s commitment to peace, friendship, and the environment. Eight students – Cheong Jia Rong, Amelia Dizon, Lee Ying Lin, Pearleen Liu, Mai Wenyi, Erin Tan Hie, Fedeline Angelina Tjong and Sarah Wee – led by Dr Margaret Tan, have been working with the Singapore Botanic Gardens to grow the seeds since December 2012. The event happened at 5.00pm on a grassy slope next to the Tembusu Learn Lobe. Distinguished guests included a representative from Green Legacy Hiroshima Professor Shin-ichi Uye, Tembusu College Rector Professor Tommy Koh, and Mr Toshihide Ando, Deputy Chief of Mission at the Embassy of Japan in Singapore. Also present were Dr Nigel Taylor, Director of the Singapore Botanic Gardens, and his staff Dr Nura Abdul Karim and Ms Sunia Teo Corina; Dr Rethy Chhem, Director of the Division of Human Health, International Atomic Energy Agency; Dr Shawn Lum, President of the Nature Society (Singapore); and Professors Leo Tan and Peter Ng from the NUS Department of Biological Sciences. Through Prof. Koh, the College received a batch of cinnamomum camphora, or camphor, seeds from the Green Legacy Hiroshima Initiative in 2012. The seeds are descendents of a camphor tree at a Hiroshima castle that had survived the atomic bombing on 6 August, 69 years ago. The camphor seeds are one of several survivor trees including persimmon and gingko, which are now growing in 18 countries including Singapore. Professor Uye hopes that these trees will act as “ambassadors of peace”. Professor Koh ended the speech with his signature three messages: that Earth is the only planet which can sustain life; his hope for no nuclear war; and desire for peace between nations, men, women and nature. Last month, Green Legacy Hiroshima, a joint UNITAR/ANT-Hiroshima initiative, received an award by the Hiroshima Peace Creative Fund for its efforts in developing international exchanges to encourage mutual understanding and long-lasting friendships.